One of the largest motorcycle events on the west coast will occur in about 3 weeks. I’m talking about the Laughlin River Run, April 24-27th. And 2014 will mark 32 years of riding on the Colorado river for this motorcycle rally. Back in 2011 the posse rode to the event and several of us are planning to do the same this year. We’re hoping the west coast drought will swing a bit north for our departure and the northwest rain will stop for a few days. 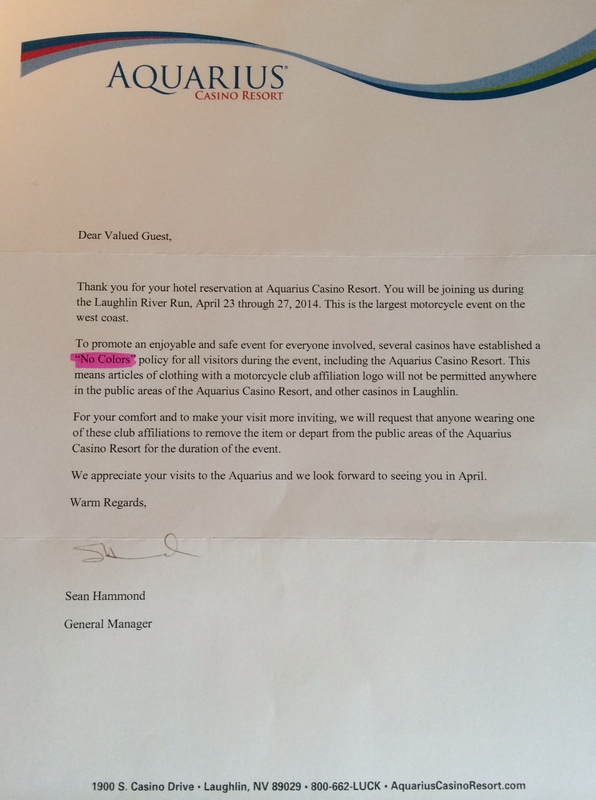 Recently one of the riders in the group received a memo from Sean Hammond, General Manager of the Aquarius Casino Resort (see photo). He outlines the “No Colors” rule being strictly enforced in all the area hotels/casinos. While it has not been without it’s issues the heavy handed LEO presence always seems unnecessary, but then again the days of HAMC clubbers performing motorcycle wheelies as guests tried to check-in at the Flamingo (as it was previously known) was a bit of a nuisance. Sure the room rates are artificially raised as is the cost to get there, but for those of us who don’t have 300+ days of riding, the opportunity to ride the Sierra Nevada mountains and take in historic U.S. Route 66, along with the hills of Oatman is always a memorable experience. And it’s a bonus this time of year as the byways are less-traveled and there are few tourist in motorhomes clogging the open road views.